The New Zealand Rugby Union (NZRU) have revealed that they are prepared to offer more sabbaticals to encourage leading players to commit their rugby future to the country. All Blacks centre Ma'a Nonu is the latest high-profile name to be granted dispensation to play club rugby abroad with the 29-year-old set to link up with the Ricoh Black Rams in Japan later this year as part of a new two-year deal with the NZRU. 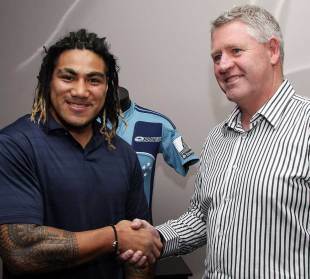 Nonu will return to New Zealand ahead of the 2012 Super Rugby season where he will play for the Auckland-based Blues. New Zealand captain Richie McCaw's new four-year deal signed in May allows him to take a break from the game or take up a short-term overseas contract and fly-half Dan Carter has also recently agreed a new deal that offers the same option. Tew is prepared to offer other players that benefit and said it was becoming an important bargaining chip to keep key the best talent in the country. "We've simply said that if we're going to be successful in keeping the best players here, particularly as they get further into their careers and they have bigger commitments with families etcetera then we are going to have to be flexible," he said. "We cannot compete on money. We have a black jersey - Ma'a made that point that that's the big thing for him so that policy we have is again endorsed - but we can do other things and that's what we're doing. "We'll sit down with each of the players and work through what's in their best interest and we're very keen for the guys to stay and play their rugby to the end if we can. If that means we have to build different things into their contracts then so be it," Tew said today. Tew remained optimistic that a decision would be made soon on the future of Sonny Bill Williams and was hopeful of tying up deals with other leading players who are either coming off contract or whose contracts have expired. "We're closer than we were yesterday it's progressing. There's a number of complexities in some these arrangements and it's all stayed very positive so we've no reason to think that we won't get there but until you get a final decision and you get ink you keep working. "Anyone who is not on contract for 2012 is very much on the radar," said Tew who added he was keen to have anyone in All Blacks contention signed before the Tri-Nations squad was named on July 10 but said some might not be signed until the World Cup. Nonu rejected overseas suitors to remain in New Zealand and said the lure of the All Blacks jersey was the driving force behind his decision. The 56-cap centre was deemed surplus to requirements by Hurricanes management two weeks before the end of this season prompting a global scramble for his signature, but said he was not ready to turn his back on New Zealand. "I love playing for this country and that was one of the main reasons why I stayed," he said. He consulted former players about playing overseas but said it was not the time for him to end his All Blacks career. "I thought about it a few times (going abroad) but I can't leave New Zealand - not yet," he said. "It's more or less letting go of your dream and that's playing for the All Blacks. I've got a chance to try and keep making that side while I still can." Nonu said he was keen to move on from the controversy that surrounded his departure from the Hurricanes after 110 appearances for the franchise. His signing was welcomed by Blues coach Pat Lam whose side play their Super 15 semifinal against the Reds in Brisbane on Saturday. "It's no secret there was a lot of interest in securing Ma'a by teams both locally and around the world. He is a quality player so it's great news for the Blues that he has chosen our team in which to continue his impressive rugby career," Lam said. The retention of Nonu is the latest piece of contract dealing by the NZRU which has seen them commit 26 leading players to stay in the country after this year's rugby World Cup. Aside from Nonu, McCaw and Carter hookers Keven Mealamu, Corey Flynn and Hikawera Elliot, props Tony Woodcock, Ben Franks and Wyatt Crockett, locks Ali Williams, Anthony Boric, Tom Donnelly and Sam Whitelock, loose forwards Jerome Kaino, Kieran Read, Daniel Braid, Liam Messam and Victor Vito and backs Jimmy Cowan, Alby Mathewson, Colin Slade, Conrad Smith, Benson Stanley, Ben Smith, Israel Dagg and Aaron Cruden have signed new deals.